To honor Donald Henry Barron, each semester one invited speaker of the Perinatal and Reproductive Biology Group Seminar Series is designated the Donald Henry Barron Lecturer. Professor Donald Henry Barron was born on a farm in Flandreau, South Dakota, on April 9, 1905. He received the B.A. degree in Chemistry from Carleton College in 1928, the M.S. degree in Botany from Iowa State College in 1929, the Ph.D. degree from Yale University in 1932 and an honorary M.A. 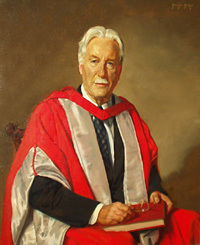 degree from Cambridge University in 1936.Professor Barron’s contributions to fetal-placental physiology were numerous and for these contributions Dr. Barron and Sir Joseph Barcroft together are considered the “Fathers of Fetal-Placental Physiology.” Professor Barron was a fellow of the American College of Obstetricians and Gynecologists and of the Royal College of Obstetricians and Gynecologists and has been referred to as the “Father of Scientific Obstetrics.” After a distinguished career as a biologist, anatomist, neurophysiologist, and fetal-placental physiologist at Cambridge University (1932-1940), University of Missouri (1940-1943), and Yale University (1945-1969), Professor Barron was named Professor Emeritus at Yale University. In July 1969, Professor Barron moved to the University of Florida to occupy the J. Wayne Reitz Chair in Reproductive Biology and Medicine; there he began his second career. At that time, many UF faculty and students benefited from Professor Barron’s counsel daily. He was an exceptional example of how, through collaboration, scientists may educate one another in the principles of Perinatal and Reproductive Biology, and make significant contributions to the group through research and teaching. There was and always will be a profound respect for Professor Donald H. Barron and the acknowledgement of his central role in the development of the intellectual climate and spirit of collaborative research that is the hallmark of the University of Florida Perinatal and Reproductive Biology Group. Surendra Sharma, Professor, Department of Pediatrics & Director, COBRE for Reproductive Health, Women and Infants Hospital of Rhode Island. Ronald R. Magness, Director, College of Medicine Obstetrics & Gynecology, University of South Florida, Tampa, FL. David Albertini, Director, Division of Laboratories, Center for Human Reproduction, New York, NY. S. Ananth Karumanchi, Associate Professor of Medicine, Beth Israel Deaconess Medical Center; Harvard Medical School. Jim Lauderdale, Pharmacia & Upjohn, Inc.